Dude, first The Doors, now The Nuge’, looks like the Nokia Theatre is havin’ a little trouble puttin’ asses in the seats. 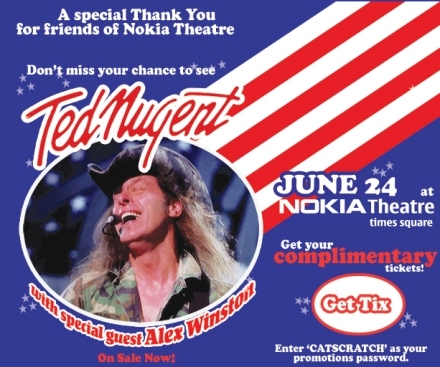 Get your free tickets to Ted Nugent at Nokia theatre here, password CATSCRATCH. PS Don’t forget to check your bow and arrows at the door. PPS They’re not actually 100% free, you still have to pay a convenience charge. Hey Dave, I saw Bad Religion/Pennywise/Anti-Flag/Murphy’s Law at the Nokia when I was in New York. And tried to get tix to the Pogues but it was all sold out. What happened? The Nokia used to send me e-mails, but they stopped for some reason. Anyway, you going to check out the Nuge? No, not going to the Nuge. I figure that $5.00 in ticketmaster service fees could probably be spent better elsewhere. You can become a friend of Nokia on MySpace, they sent out a bulletin about the “free” Nugent show.